From his first vintage in 1995, Marco Ricasoli-Firidolfi has crafted powerful, yet elegant wines imbued with real character. This vertical tasting of Rocca di Montegrossi's Chianti Classico Vigneto San Marcellino once again showed the pedigree Sangiovese is capable of in the hands of an inspired grower guided by a desire to make wines that express the essence of site and vintage. I tasted every vintage back to the inaugural 1995, with the exception of the 1997 and 1998, of which there are no remaining stocks at the winery. In their place, Ricasoli opened the 1995 and 1996 Geremia, which provided fascinating contrasts to the San Marcellinos of the same years. The Ricasoli family’s history is a tapestry laced with numerous strands that speak to the rich cultural legacy that runs through Tuscany and Chianti Classico. Originally of Longobard origins, the Ricasolis trace their lineage back to at least the 7th century, which makes them one of the oldest families in Tuscany. Records show that the Ricasolis owned the Brolio castle as far back as 1141. In the 12th and 13th centuries the Ricasolis were feudal lords tasked with protecting Florence from the Republic of Siena during the Wars of the Guelphs and Ghibellines. The Ricasolis were also among the first families to recognize the potential of their land for agricultural purposes. In more contemporary times, and as it pertains to wine, the Ricasoli history starts in the 19th century. Bettino Ricasoli, known as the Iron Baron, was one of the creators of Chianti wine in the late 1800s and served twice as Prime Minister of Italy. Our story begins with Bettino Ricasoli's great-grandson (also named Bettino) and his brother, Alberto, along with their four sisters. In the 1960s, this generation of the Ricasoli family sold the “Barone Ricasoli” brand to Seagram’s, but retained ownership of the Castello di Brolio, its vineyards and land. At the time, the family had an arrangement to sell grapes and bulk wine to the Barone Ricasoli label. Later, in 1993, Francesco Ricasoli bought the estate back, but that is a tale for another day, and another article. Frustrated by a lack of control, Alberto decided to leave the family winery. It was the mid-1960s, a time when Chianti Classico did not enjoy anywhere near the kind of visibility it does today. Alberto and his wife, Elisabetta, moved to Castello di Cacchiano, where they planted vineyards for their new estate between 1965 and 1968. Sadly, Alberto passed away in 1972, before seeing the real fruits of his labor. A few years later, American wine broker Marc de Grazia, who was just getting started, sought to represent Cacchiano, but was not able to reach an agreement to do so because the winery had an exclusive agreement with another importer. 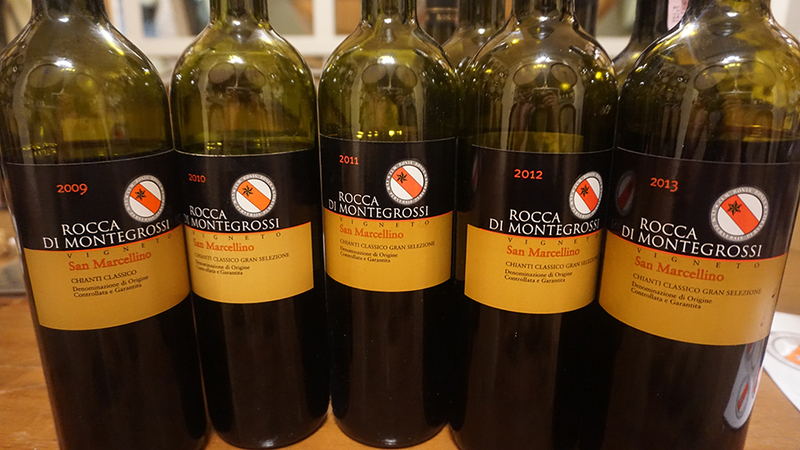 Elisabetta Ricasoli created Rocca di Montegrossi as a way of meeting this increased demand. She named her new label after the fortress on the site of the first Ricasoli settlement, which dates to 1530, and later dedicated the top wine to Geremia, the family patriarch. During this time, Rocca di Montegrossi was essentially a sister label to Castello di Cacchiano. The wines for both labels were made from the same vineyards. Alberto and Elisabetta had two sons, Giovanni and Marco, and a daughter Claudia. In time, the two sons would have a falling out that ultimately led to Marco leaving the family winery to set up his own estate in 1994. He was just 24 at the time. Elisabetta gave Marco a small 7.5 hectare vineyard with which to start his new project and the Rocca di Montegrossi brand. That vineyard, San Marcellino, takes its name from the church that is on the property. Marco also received help from his aunts, Francesca and Lisa, who had no direct heirs and contributed vineyards as well as a winemaking facility that was later renovated with substantial investment. Rocca di Montegrossi is located in Gaiole, a large commune that shares a border with Radda to the north and runs south nearly all the way to Siena. While it is tempting to try to ascribe specific characteristics to the communes of Chianti Classico as is often done in Piedmont and Burgundy, that is a frustrating exercise here, where the terrain is both vast and also highly varied. In very broad terms, though, we can say that Chianti Classicos from Gaiole tend to be richer and weightier than those of the northern sectors closer to Florence, with Panzano’s Conca d’Oro a notable exception. The Rocca di Montegrossi estate lies next to Il Palazzino in Gaiole’s Monti district, itself part of a triangle of vineyards in the south of the commune that includes Brolio and San Giusto a Rentennano. Monti and the estates that surround it are quite different in character from the stretch of higher-altitude vineyards to the southwest that runs through Ama and San Sano and the patchwork of sites that surround the town of Gaiole itself. The alberese soils here are rich in calcium, which is one of the reasons the wines are so intense in color. In its current incarnation Rocca di Montegrossi's first vintage was 1995. At the time, the estate made a Chianti Classico Vigneto San Marcellino that was mostly Sangiovese with a touch of Canaiolo, and the Geremia, which was a 100% Sangiovese IGT in the mold of Le Pergole Torte, Flaccianello, Cepparello, Percarlo and other pure Sangioveses that were created during a time when Chianti Classico regulations required growers to blend in other grapes, thereby expressly forbidding 100% Sangiovese wines from being Chianti Classicos. The San Marcellino was first released as a Chianti Classico Riserva. Fed up with what he viewed as inconsistent quality in Riserva bottlings, Ricasoli withdrew from that designation with the 1999 vintage. Since 2010, San Marcellino has been a Gran Selezione, a relatively new tier in the qualitative hierarchy that was created for the finest estate Chianti Classicos. The original San Marcellino vineyard was developed in the 1960s. Like many vineyards planted during this era, the focus was on quantity rather than quality, hence the desire to make two selections of Sangiovese. Ricasoli began converting the vineyards with an emphasis on quality. By 2006, all of the vineyards were farmed organically. In the mid 1990s, Ricasoli also planted Merlot and Cabernet Sauvignon. Once those vines were of sufficient age, they gave birth to the present-day Geremia, a blend of 70% Merlot and 30% Cabernet Sauvignon, starting with the 2001 vintage. The Chianti Classico Vigneto San Marcellino then gradually became a pure Sangiovese starting in 1999 through 2006, when a dollop of Pugnitello was added to the blend. Today, Rocca di Montegrossi makes a straight Chianti Classico and a Rosé that are both consistently among the best wines in their respective categories. The dual flagships remain the Chianti Classico Gran Selezione Vigneto San Marcellino and the Geremia. Rocca di Montegrossi also excels with Vin Santo, which here is done in a rich, exotic style that is compelling. Vinification for the San Marcellino has not changed much over the years, although Marco Ricasoli told me he varies his approach quite a bit in response to the unique attributes of each specific vintage. Primary fermentation lasts 10-14 days. When conditions allow, alcoholic fermentation is followed by several weeks of maceration, which can take total time on the skins to 30-40 days. Malolactic fermentation is done in French oak. In the early days, Rocca di Montegrossi relied mostly in barriques. Today, at least a third of the wine is aged in larger 500-liter tonneaux. The wines spend anywhere from 24-27 months in barrel, on the long side for present day Chianti Classico, followed by another two years or so in bottle before being released. New oak is between 15-30% and the barrels are medium toast. The first few vintages were aged and bottled at Cacchiano, but since 1998, Rocca di Montegrossi has had its own facility. The main takeaway from this tasting was how well the wines age. In a global context, Chianti Classico remains a largely undiscovered region. Despite a relatively short track record, Rocca di Montegrossi is one of its brightest stars. I tasted all of the wines in this article with Marco Ricasoli-Firidolfi during a visit to the estate in July, 2017.